When most of us get in our cars, the routine is non-negotiable. Children are buckled in safety seats or, if older, in seat belts. All the adults buckle up. When that’s all done, only then do we start the car and begin our journeys, knowing that we’ve taken an important step toward the safety of ourselves and our passengers. Unfortunately, those same safety considerations often don’t extend to our canine travelers. According to a safe dog travel study by Kurgo and AAA, only 16 percent of dog lovers are using restraints when traveling with dogs by car. Along with dangers if a crash should occur, your dog runs the risk of putting his head out an open window (and even lowering the window on his own) or moving into a seat near an air bag, which can be a danger to smaller pups. More states are regulating the transportation of dogs in cars for the safety of both the dogs and the humans. If you’ve ever had a dog suddenly hop into the front seat, into your lap, or even down near the gas or brake pedal, you know the risk of distracted driving. The Kurgo /AAA survey showed that nearly a third of drivers were distracted by their dog. Kurgo reports that an unrestrained 10-pound dog in a crash at only 30 mph will exert roughly 300 pounds of pressure, while an unrestrained 80-pound dog in a crash at only 30 mph will exert approximately 2,400 pounds of pressure. Imagine the pressure exerted at freeway speeds! On arrival, you can safely put the leash on your dog before unbuckling and removing him from the car. Regardless of prior training, an unsecured dog can become excited on arrival and quickly bolt when the door is opened. Secured dogs are safer for emergency personnel, too. If you should get into an accident and need the help of emergency workers, having a secure dog in the car allows emergency personnel to quickly enter the vehicle without concern of being bitten by a frightened dog or of accidentally allowing a loose dog out in traffic. The best way to secure your dog in the car will depend on several factors including the size of your dog and the layout of your vehicle. For small dogs, options for car restraint start with a dog car booster seat; dogs sit in the booster seat while wearing a harness that’s clipped to the booster seat. Many people like this because you still have easy access to pet your dog. 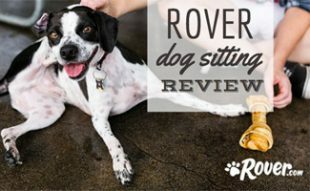 With the raised booster seat, your small dog also has a good view out the window. Small dogs (as well as cats) are also often transported in carriers. The carriers are buckled in so they can’t become projectiles in a sudden stop. For larger dogs, secured crates provide a safe option in large cars. We have an article to help you find the best dog crate. 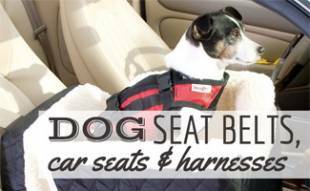 A dog car harness that buckles into seat belts or clip to cargo tie-downs is an option that work for most dogs and vehicles. We use dog harnesses and secure them to the tie-downs in the cargo portion of our Jeep. When it comes to picking a dog harness, we recommend the Kurgo Tru-Fit Smart Dog Harness on Amazon . The Kurgo harness works with any seatbelt and can also be used to walk your dog. Learn more about how this product works in the video below. If you have a SUV and a large dog, a dog barrier could a good solution. 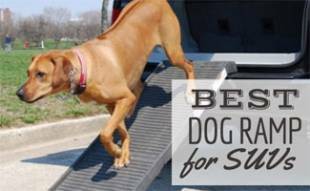 Learn more in our dog barrier for cars review. 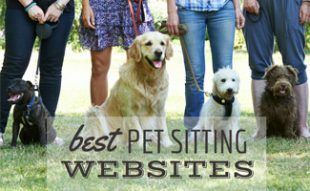 There are also dog seat covers (learn more) that create a hammock for you dog. Whether you’re planning a dream vacation or just an afternoon of errands, a few moments spent securing your canine can be a lifesaver in the event of an accident. By making securing your dog part of your regular pre-trip routine, buckling up your four-legged family members can be a snap! What do you recommend for keeping your pup safe in the car? 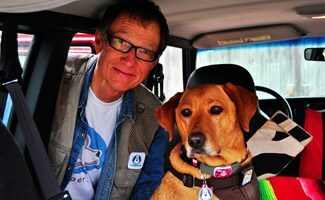 About the Authors: DogTipper.com founders Paris Permenter and John Bigley are professional travel and pet writers and the authors of over 30 travel guidebooks. 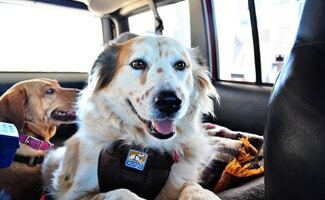 The husband-wife team authored DogTipper’s Texas with Dogs, a full-color guidebook on the most dog-friendly destinations in the Lone Star State.